Skelmanthorpe Prospect Brass – or Skelmanthorpe Junior Band as it was known then, started life back in 1994 with around 9 young players and 3 brass tutors: Neil Keer, Clare Thomas and the current Training Band MD, Robert Jaggar. In 1995, Laurence Mann (now Laurence Mann MBE) took over the handling of the Junior Band and due to the growing numbers of adult learners and playing members over the age of 21, changed its name to Skelmanthorpe B Band in 2001. Having been the MD for eight years, Laurence Mann MBE officially gave notice of his retirement from the position. Stepping into his shoes was Neil Keer. Laurence could now focus his attentions on the newly formed Skelmanthorpe Training Band. In the summer of 2004, The B Band celebrated its 10th Anniversary with a grand tour of Austria, after which, Neil resigned as MD to take up a teaching position in Wisbech, Cambridgeshire. This was also the year that Skelmanthorpe B Band registered as a fourth section band. 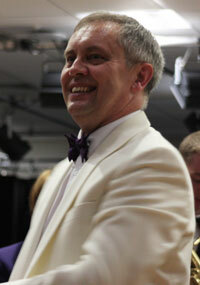 Under the leadership of Robert Broadhead, the band entered its first Yorkshire Regional Final in Bradford, 2005. Shortly afterwards, Chris Askew took up the baton for the B Band but due to work commitments, resigned just a few months later. In 2006, Phil Garlick – the Band’s current MD, took over the reins and under his superb direction, in 2007, the band won second place at the Yorkshire Regional Finals, earning themselves a place at the National Brass Band Finals in Harrogate, where they were awarded third place. What a fantastic achievement for such a young band. A year later, once again, with an excellent result from the Yorkshire Regional Finals, the B Band qualified for the National Brass Band Finals but the icing on the cake this year was the band’s promotion to the third section. Between 2009 and 2013, the B Band gradually worked its way to the top of the third section. In 2012 it was placed a creditable 4th at Regional Finals but in March 2013, the band was awarded 2nd place playing a fantastic rendition of Goff Richard’s composition, ‘Hollywood’ at St Georges Hall, Bradford. The Band continues its wave of impressive contest results and dazzling concerts, under the motivational leadership of Phil Garlick and from January 2014, the Band changed its name to Skelmanthorpe Prospect Brass and competes in the second section.